65daysofstatic, no strangers to touring japan, asked us to put together a small promo clip for their forthcoming japanese tour. using footage we shot the last time they toured out there, this piece gives you a little taste of what it’s like to be right there with them on the road to such places. once again we could not be more grateful to topspin. they have put us in touch with an eclectic range of radical artists with whom we’ve had the most exciting and rewarding relationships. 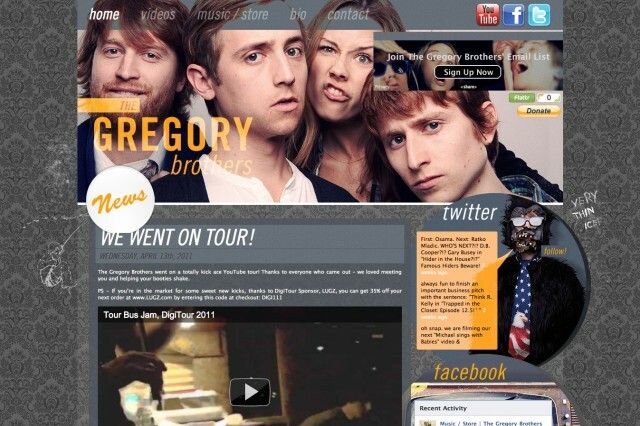 the gregory brothers, better known as the auto-tune the news guys, are no exception. a month or so ago they walked into our studio and told us they needed a new website. they then hit the road and we sent them our ideas as they criss-crossed the country on the youtube tour. the trick was to combine their already burgeoning aesthetic with a number of new levels of functionality. their old site had been pretty much built entirely by them using dreamweaver and they were understandably into something that would be a little easier to update. needless to say, but the process was a breeze and often funny too. as the project went on we of course became more and more familiar with their work. aside from the classic auto-tune videos that we’ve all seen, it was very apparent that they were a talented 4 piece band in their own right. not only are they capable of making a hilarious youtube videos but they’ve got an album’s worth of solid, self-proclaimed?folk ‘n’ roll jams. hit up the music store on the new site to check some of them out. they just got back from playing bonnaroo festival and i’m sure will be announcing more tour dates soon. seriously, go. they’re fantastic people and their show is seriously unique.